It’s that time again! 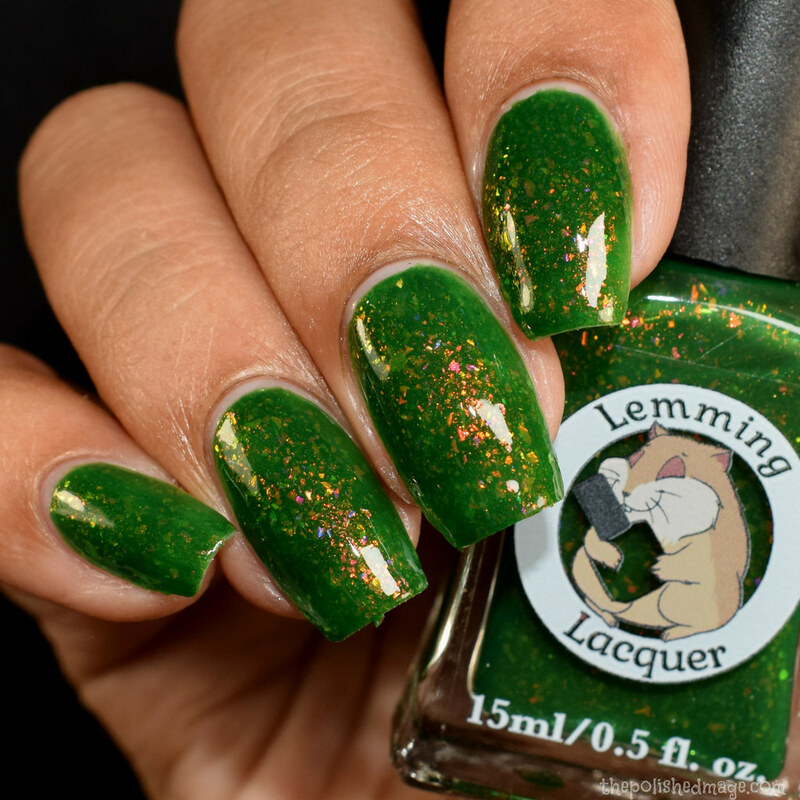 This is the last Polish Pickup for 2018 and it’s coming in with a bang! This month’s theme is Enchanted Forest, and the inspirations are amazing! I have seven beauties that will be launching next weekend and they are enchanting! Inspiration: Our favorite forest dwelling fairy tale character, Little Red Riding Hood. 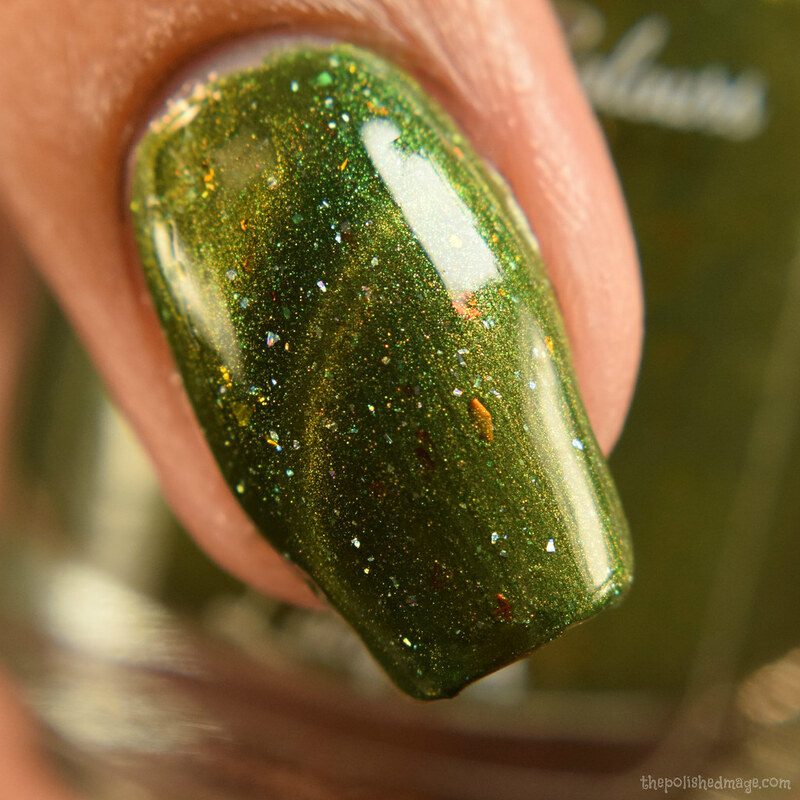 Description: A maroon based holo with holo flakes. Swatches show two coats with topcoat. Formula has a rich jelly feel that builds easily. I had full opacity at two normal coats, so I stopped there as I felt like it looked perfect. I feel like this is one of those that depending on the coats you apply, depends on how deep the color is. I think if I went to three coats, I’d see a darker base. The holo is super sparkly and the flakes gave me no trouble. No texture after topcoat. 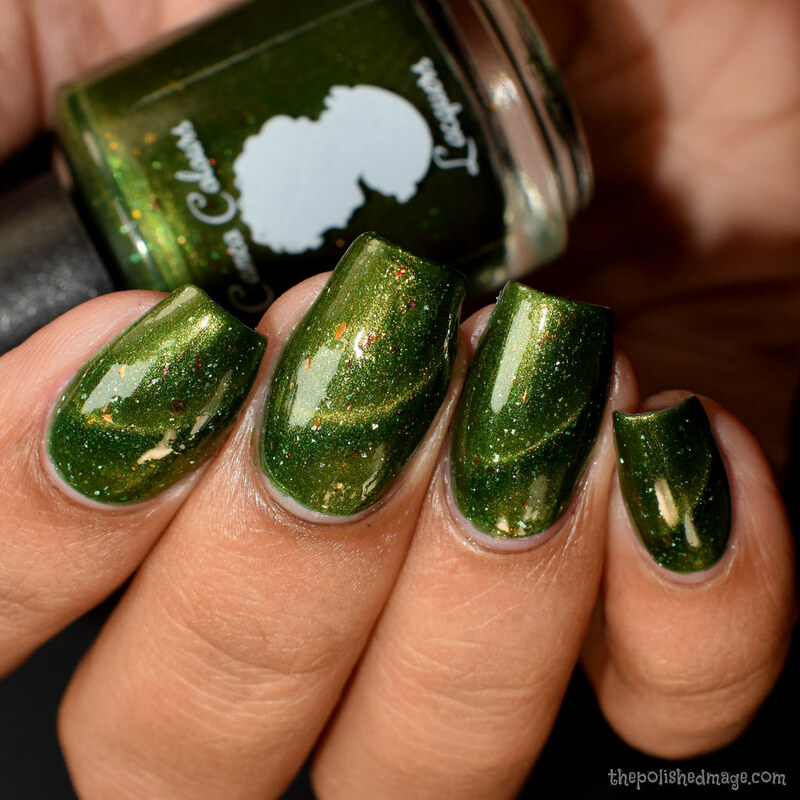 Description: A deep mossy green base with a magnetic golden shimmer, full of silver holographic micro flakes and red/bronze/copper ultrachrome flakes. Swatches show two coats with the magnet applied on the second coat. Formula has a rich, dense feel during application. The base is a gorgeous mossy green and the magnetic particles moved very easily for me. 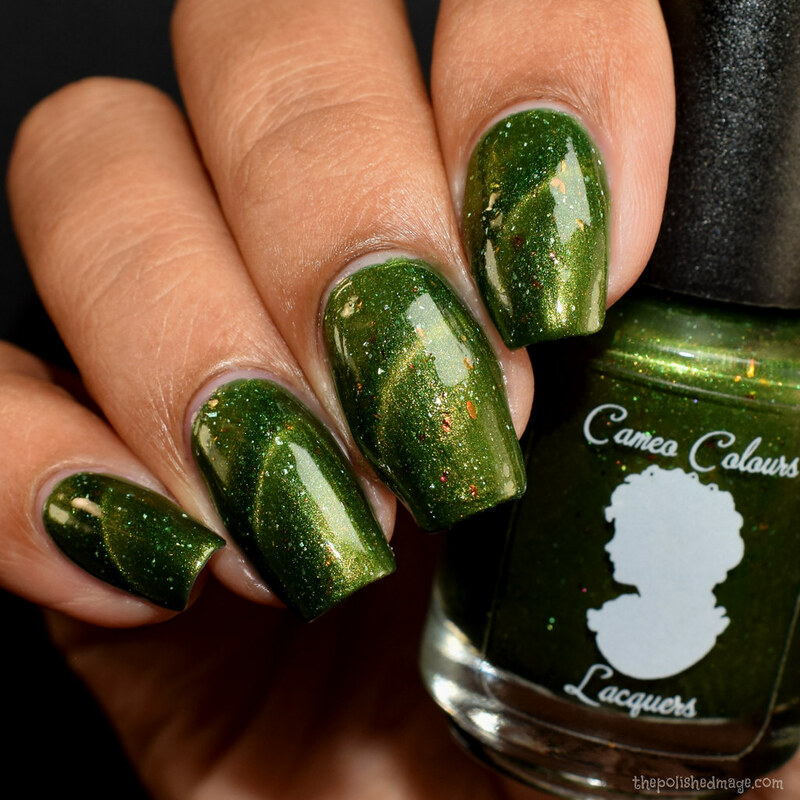 It gives a golden line across the green and is complimented by the contrasting colors of the flakes. Those flakes are beautiful and big, and they laid down flat for me. No texture after topcoat. Description: A vivid pink base with red/gold aurora, purple iridescent flakies, green UCC flakes, red-gold micro flakies, green to gold chameleon micro glitter, gold flakies, and purple and orange holo micro glitter. Swatches show three coats with topcoat. I can see this one doubling as a beautiful topper, it starts off sheer but built to full opacity for me at three coats. There is a lovely golden glow at extreme angles that you can see in my macro shots. 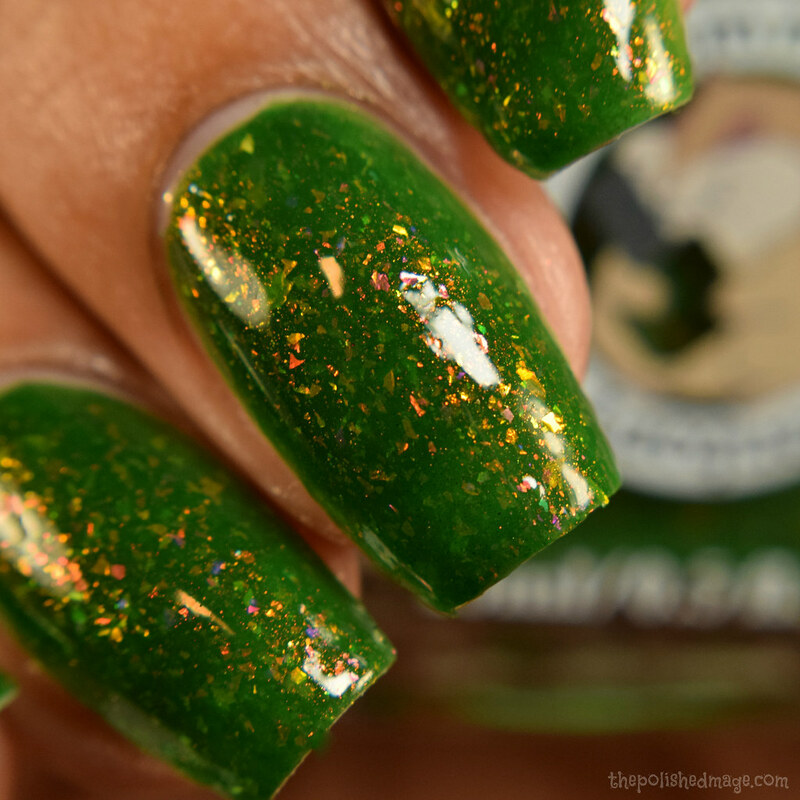 I didn’t need to fish for any of the goodies in this polish, and I had complete smoothness after topcoating. Inspiration: Inspired by what I see in my mind while listening to Rabbit Heart by Florence + the Machine: a spring meadow with pink and purple flowers glowing with sunlight. Description: grassy green with fiery shifting shimmer and purple/blue/gold/orange/pink iridescent flakes. Swatches show three coats with topcoat. This one build to opacity for me at three coats, but I think depending on nail length you might be able to get away with two. The formula has a squishy jelly feel during application and the flakes picked up easily on the brush. No texture after topcoat. Inspiration: the colors of the Puerto Rican parrot and our rainforests, because we are known as The Aisle of Enchantment, and I couldn’t think of a better and more enchanting forest to use for inspiration. Description: A dark green base with green-blue multichrome sparkle on one angle, and a contrasting indigo-purple-red shimmer at other angles. For the most intense multichrome shift, stamp over a black or dark polish. Swatches show two coats on it’s own, and stamped over white and black. Formula has a heavy feel and applies very rich and smooth on it’s own, and stamps very easily. I used a Moyou London holiday plate 03 here, and a super squishy stamper from Lantern and Wren. It does dry down a touch on the satin side, so if wearing on its own I’d suggest a glossy topcoat. This is what I’d call a vampy multichrome, there is an overall dark appearance with teals, purples and blues lighting up on certain angles. 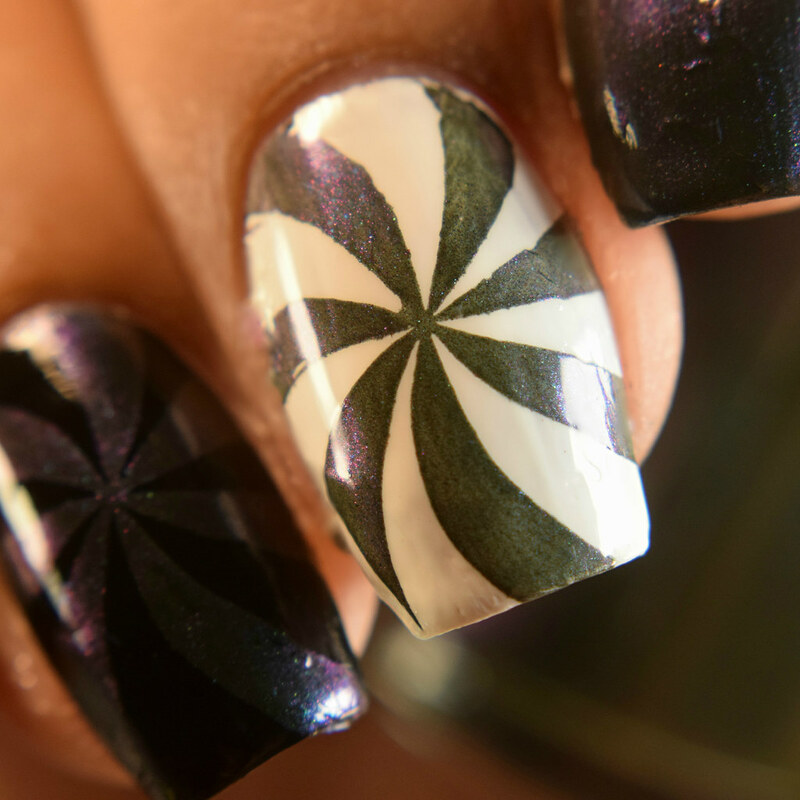 When stamped over white and black, you can really see the multichrome shift come out to play. Inspiration: The forest from the show Gravity Falls, specifically the adorable gnome Shmebulock. Description: this is a taupe leaning grey crelly with charcoal flakes, taupe micro flakies, blue/green & red/copper/gold/green shifting crystal chameleon flakes. Swatches show three coats with topcoat. Formula has a light-medium feel and builds easily. The rainbow of flakes give a pastel speckled appearance against the neutral base. I had no trouble picking them up from the brush and they laid down flat during application. No texture after topcoat. Description: starts off with a turquoise jelly base with a healthy dose of multichrome pigment that shifts from green to gold to blue, add to that a mix of 8 UCC flakies and crystal chameleon flakies and all topped with silver holographic pigment and micro flakies to give a little bit more sparkle. Swatches show three coats with topcoat. Formula has a jelly feel during application and built up easily for me. This one is loaded with goodies, that picked up easily on the brush and laid down flat. There’s a densely scattered sparkle and a shift that reminds me of the blue to green UP sibling pigment though this does not have that pigment, it does have a strong blue glow on extreme angles with a golden glow in bright/normal lighting. No texture after topcoat. 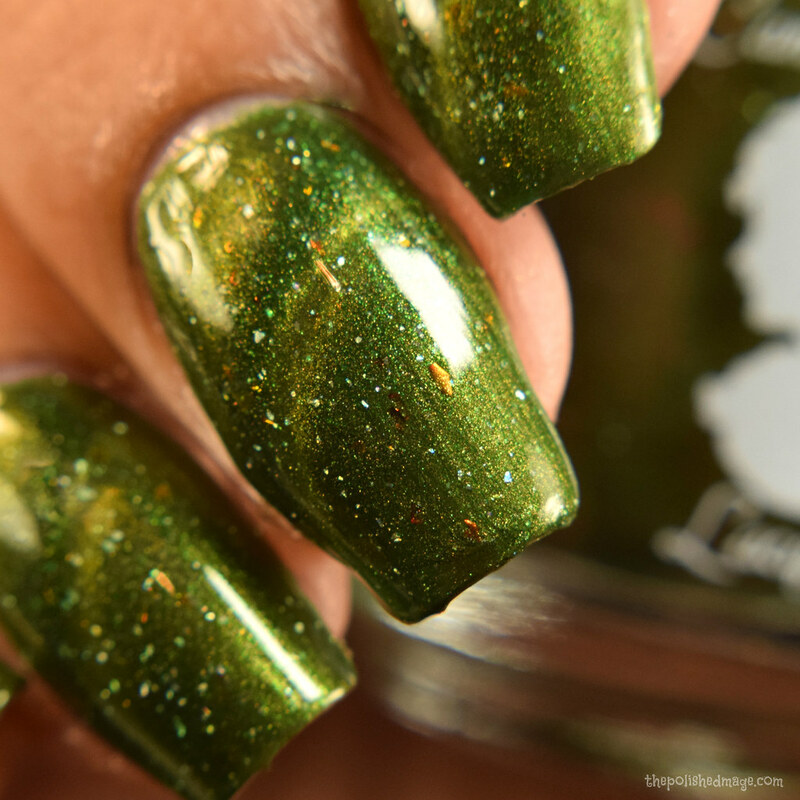 Polish Pickup opens December 7th at 11am EST through December 10th at midnight EST. This month is not operating on a pre-order, so there are lots of caps on polishes! Be sure to check out the shop now so you can get that wish list started and be in and out when the site opens!